Timeline of Scrum in 1 slide ! 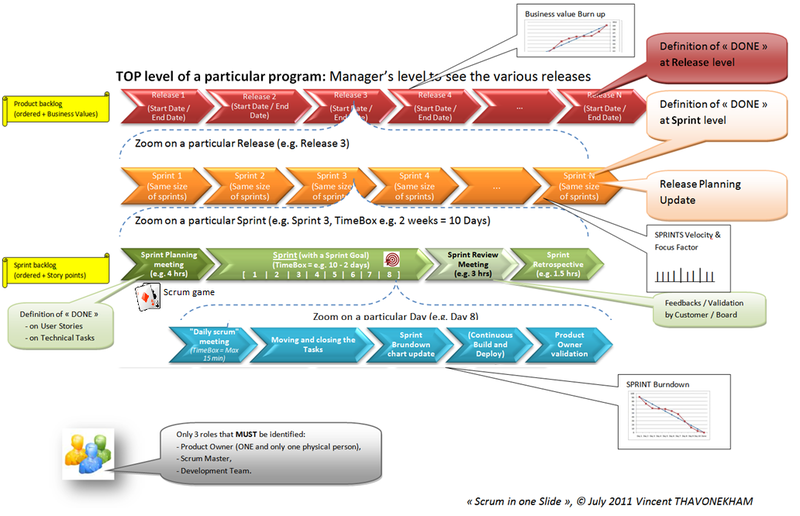 July 2011 : The creators of Scrum released a new version this month. Ken Schwaber and Jeff Sutherland published “The Scrum Guide” in many languages (http://www.scrum.org/scrumguides/). To celebrate that, I wanted to summarize Scrum and fit most of it into 1 slide ! To keep it as simple as possible, I skipped on purpose some concepts. Feel free to use it / modify it, and if possible send me your feedbacks so I can make it evolve too. as well as some of his other books "Succeeding with Agile: Software Development Using Scrum".